In 1459 the astronomer’s grandfather, Lucas I Watzenrode received the house at St. Ann Street (today Kopernika 15) in payment of his nephew Simon Falbrecht’s debts. He then gave the house to his daughter Barbara and her husband. They were certainly living there in July 1462. Nicolaus’ father had trade contacts with Gdańsk at that time. Like other citizens of Toruń, he paid taxes and gave the city loans to carry on the war: to pay for the Toruń troops besieging Świecie, and to construct a bridge over the Vistula River. In May 1464 he participated as a legal guardian of his wife Barbara in the division of inheritance after her father’s death. The Copernicus family received, among other things, a house at St. Ann Street (Kopernika 15 – the House of Mikołaj Kopernik, a branch of the Regional Museum in Toruń) in which they lived. On 8th July 1468, Mikołaj Kpernik bought half of a house at the Market Square (today number 36), from Jacob Michaelis of Gdańsk. The mortgage of the house was encumbered additionally with 100 grzywnas for the benefit of Laurentius Scholze, whom the astronomer’s father paid off the following year. 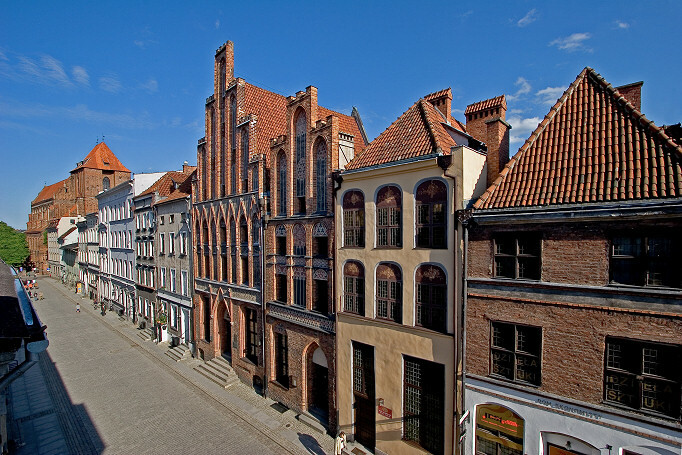 The house in the Market Square was one of the most magnificent and best-situated in Toruń. It stood at the most important Market Square frontage, next to which the trade route from the south to the north ran through the city. The house itself stood out from the surrounding buildings owing to its glazed bricks in the facade, which was the reason why it acquired its own name “The Glazed House” (Glasenhaus.) From the end of the fourteenth century the owners of the second half of the house were the Watzenrodes. Thus, the Koperniks only bought the other part of the house, and probably moved there soon after settling the mortgage issues. This must inevitably have happened before the birth of their youngest son, Nicolaus. Therefore, the only house that the future astronomer regarded as his home, was the dignified building in the Market Square (No. 36). The indicated house is the fourth “birth place” of the great astronomer in Toruń. The inhabitants of Toruń have not recorded the information about his birth place. It was not until the eighteenth century that a chronicler of Toruń Jacob Heinrich Zernecke announced that Copernicus was born in a house located at the corner of Starotoruńska and Piekary (now Kopernika 40) streets. Although Zernecke did not provide any sources of his conjecture, in the 1760 calendar this place was again fixed in the city tradition. The well in the courtyard was even called “Copernicus’ Well” and travelers were shown a room inside the house, where the great astronomer was supposedly born. This is the very house to which the Toruń counselors brought Napoleon Bonaparte who wished to visit the house of the well-known scholar during his visit to Toruń in 1812. Although in the mid-nineteenth century, the then owner of the building liquidated “Copernius’ room” and rebuilt the house, destroying its Gothic appearance, until 1881 the house was considered the birthplace of the astronomer. In 1871 a plaque was put up on the house stating that Nicolaus Copernicus had been born there. The plaque was sponsored by the scientific society Coppernicus-Verein. It was taken away from Toruń during the Second World War and it disappeared. Ten years later, an outstanding mayor of Toruń and a historian, Georg Bender argued that Copernicus was born in the house at St. Ann Street (today Kopernika 17). Yet until the end of Prussian rule, the house at No. 40 was considered the true birthplace of the astronomer. After the takeover of Toruń by Poland, in 1923, the city authorities funded a plaque giving information about Copernicus’ birthplace. The plaque was put up on the house at Kopernika Street 17. In the years 1960-1963 the house was under conservation. It was joined with the adjacent house number 15 which was much more sumptuous and had a preserved Gothic arrangement. This became a branch of the District Museum devoted to the life and work of Nicolaus Copernicus. The inscription “The House of Copernicus” was put up in the portal of the house number 17. This, however, did not end the dispute. Another, though this time slightly smaller, “revolution”, took place in the late 1970s. After a careful analysis of the sources, it turned out that the house that belonged to Nicolaus Kopernik Senior (the astronomer's father) was at ul. Kopernika 15. A few years ago, the moving of the plaque saying “The House of Copernicus” to its proper place (the portal of the house No. 15) marked a symbolic end to the dispute over the location of the house of the Kopernik family at St. Ann Street. 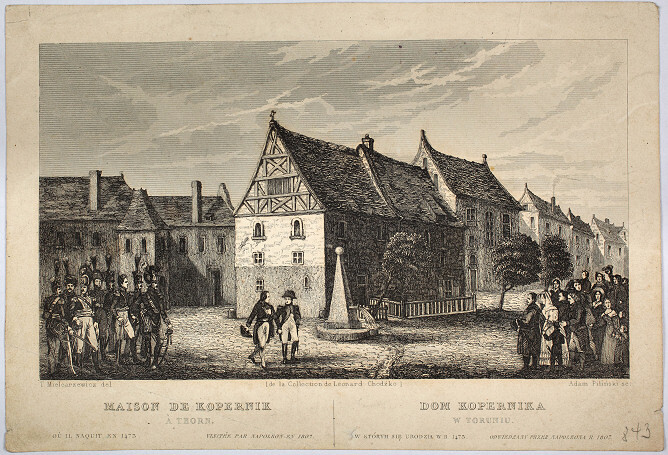 However, the determining of its proper location did not bring an end to the dispute about the astronomer’s birthplace. Already in 1973, a suggestion was made that the Kopernik family moved to one of the richest houses in the Market Square known as the “Glazed House” (house No. 36) as early as 1468, and not shortly before the year 1480, as stated in the literature so far. The discussion over the birthplace of Nicolaus Copernicus has been ultimately settled by the evidence that half of the house had belonged to the family of the astronomer’s mother already from the end of the fourteenth century. K. Górski, Dom i środowisko rodzinne Mikołaja Kopernika, 3rd edition, Toruń 1987. K. Górski, Domostwa Mikołaja Kopernika w Toruniu, Toruń 1955. T. Jasiński, Dom rodzinny Mikołaja Kopernika: przyczynek do studiów nad socjotopografią późnośredniowiecznego miasta, “Kwartalnik Historyczny”, v. 92: 1985, No. 4, pp. 861-884. K. Mikulski, Nicolaus Copernicus. Life and work, Toruń 2009. K. Mikulski, Watzenrodowie i dom rodzinny Mikołaja Kopernika w Toruniu,in: Studia z dziejów miast i mieszczaństwa, v. 2, eds. J. Tandecki, R. Czaja, Toruń 1996, pp. 243-256.